Objective: To assess the effectiveness of conflict of interest disclosure policies by comparing a competing interests disclosure statement that met the requirements established by the journal in a 2003 article on health effects of secondhand smoke based on the American Cancer Society CPS-I dataset with internal tobacco industry documents describing financial ties between the tobacco industry and authors of the study. Design: Descriptive analysis of internal tobacco industry documents retrieved from the Legacy Tobacco Documents Library, University of California, San Francisco. Results: Meeting the requirements for financial disclosure established by the journal did not provide the reader with a full picture of the tobacco industry’s involvement with the study authors. The tobacco industry documents reveal that the authors had long standing financial and other working relationships with the tobacco industry. Conclusion: These findings are another example of how simply requiring authors to disclose financial ties with the tobacco industry may not be adequate to give readers (and reviewers) a full picture of the author’s relationship with the tobacco industry. The documents also reveal that the industry funds research to enhance its credibility and endeavours to work with respected scientists to advance its goals. These findings question the adequacy of current journal policies regarding competing interest disclosures and the acceptability of tobacco industry funding for academic research. The article included a lengthy statement of funding sources and competing interests, listing as one of its sponsors the tobacco industry’s Center for Indoor Air Research (CIAR). Peer reviewers tend to be more critical of articles with industry sponsorship than those without such sponsorship.8 One rapid response to the Enstrom and Kabat article suggested that it might be useful for editors to “require a statement about the role of the funding source in the design, conduct, analysis and reporting of the data”.9 Earlier tobacco industry funded studies of the health effects of secondhand smoke have failed to fully disclose the sponsor’s role in the research.10,11 In contrast to these earlier situations, the Enstrom and Kabat paper was consistent with the requirements for such statements established by the BMJ. The inadequacy of journal article disclosures when compared to information on financial ties of authors obtained from other sources has led experts on disclosure to suggest more comprehensive policies and stronger enforcement of existing policies.14,16 For example, experts have suggested that journals require disclosure of exact amounts and duration of financial ties, and that journals clarify how they define the “relevance” of a financial tie to the research.15 A number of scholars have argued that corporate sponsorship of research or financial ties of authors should be prohibited.14,17,18 These proposed bans eliminate the need for disclosure to “manage” the conflict of interest and protect against even the appearance of conflict. The Enstrom and Kabat paper provides an interesting case study to test this suggestion precisely because they provided an extensive disclosure that met the current BMJ standards for such disclosure. Using methods similar to that of Krimsky, we compared the disclosure in a scientific journal article with information on financial ties of the authors obtained from an independent source.19,20 We compare the disclosure Enstrom and Kabat provided in their article with internal tobacco industry documents describing their relationship with the tobacco industry in order to obtain details of the history and nature of their association, with the goal of understanding whether a disclosure statement that met BMJ’s requirements gave the reader a clear description of the role of the tobacco industry in the study and the historical relationship of the authors with the industry. We retrieved documents from the Legacy Tobacco Documents Library (www.legacy.library.ucsf.edu) using the terms “Enstrom”, “Kabat”, “CIAR”, “CPSI”, “CPSII”, “Womble Carlyle”, and “Shook, Hardy and Bacon” and names of key individuals, followed by “snowball searches”. We collected 156 documents; 81 discussed the development of the CPS-I data analysis or other research by Enstrom or Kabat. Table 1 summarises financial ties between the authors and the tobacco industry. The disclosure statement was long, 305 words, compared to the average of 127 words in the 20 other research articles published in BMJ that month. Of these 305 words, 98 related to the tobacco industry (table 2). The disclosure states that the research was supported by the tobacco industry after continuing support from TRDRP was denied and that “[i]n recent years” Enstrom received research funding from the tobacco industry because he was unable to obtain equivalent funds from other sources. Although these statements are accurate and comply with Enstrom’s reporting obligations under BMJ policy, the tobacco industry documents also show that Enstrom had a long history of association with the industry. In 1975, he approached the Council for Tobacco Research (CTR), a tobacco industry research organisation, to fund a study of cancer among US Mormons.23,24 He argued that the study “should be helpful in assessing the possible role which other factors besides smoking play in the etiology of lung cancer”.24 The proposal was deferred for discussion by the Executive Committee, Scientific Advisory Board of CTR in June 1975.25 Although Enstrom requested a letter of support from the Tobacco Institute, the industry’s trade organisation in the USA,26 and modified his experimental design in April 1976,27 there is no record that the proposal was funded. In 1978, Enstrom submitted another request to CTR to study “Smoking cessation and mortality trends among California physicians”.28 There is no record that this proposal was funded. The industry documents reveal little interaction between the tobacco industry and Enstrom from 1979 until 1990, when the tobacco industry began to recruit Enstrom as a potential critic of research on secondhand smoke. In 1990, Thomas Borelli, Manager Scientific Issues, Philip Morris, asked Enstrom, among others, to comment on a PhD dissertation by Luis Varela.33,34 Borelli was interested in the dissertation because it contained findings suggesting that secondhand smoke exposure was not associated with disease. The industry frequently cited the dissertation as evidence that should be included in risk assessments of secondhand smoke.35 In contrast to the preliminary results in the dissertation, however, the final publication in the New England Journal of Medicine36 concluded that childhood exposure to secondhand smoke was associated with adult lung cancer. JAMA rejected the paper.65 Although Enstrom’s response to the peer reviewers’ comments was circulated within the law firm Womble and Carlyle,66 it is unclear whether the paper was resubmitted to JAMA. It was not published. We did not find any documents showing that this “model protocol” was developed. At its meeting on 25–26 November 1996, the CIAR board of directors decided that Max Eisenberg (Director, CIAR), Richard Carchman (Vice President, Scientific Affairs, Philip Morris), and Charles Green (CIAR, Chairman of Board and Principal Scientist, Research and Development, RJ Reynolds)86 would visit Enstrom at the University of California, Los Angeles. Enstrom’s proposal was not funded at that time. The published disclosure in the Enstrom and Kabat paper,1 which meets the requirements established by BMJ, does not reveal the full extent of the relationship the authors had with the tobacco industry. Tobacco industry funding of research is associated with favourable outcomes for the industry.115–117 Reasons for this observed association are complex and include sponsor involvement in the research questions asked, design, conduct, and publication of the study.118 The Enstrom and Kabat paper is another example of how the content of even an extensive funding disclosure that meets the journal’s requirements may not allow readers to understand fully the nature of the relationship between the authors and the research funder.10,11,119 The history of Enstrom’s contacts and collaborations with the tobacco industry illustrates several reasons why the industry funds scientific research. First, although industry insiders were critical of Enstrom’s methods, they nonetheless funded the research to enhance the industry’s credibility, particularly by touting an association with the American Cancer Society. Second, the industry funded Enstrom because it perceived that his connections might be useful in the future. Enstrom had contributed to a Surgeon General’s report on smoking and some of his early work suggested that secondhand smoke might be associated with cancer. Funding Enstrom allowed the industry to work with a scientist to advance its goals, as it has with other scientists.89 Third, funding Enstrom provided access for industry executives to seek to influence his research protocols by suggesting modifications. Lastly, funding Enstrom allowed the industry to connect him with other tobacco industry affiliated researchers, such as Kabat. Earlier studies of the health effects of secondhand smoke funded by the tobacco industry have failed to fully disclose the sponsor’s role in the research. In addition to incomplete disclosures, industry sponsorship of research is often not entirely disclosed. Disclosure of financial ties can make reviewers more critical of manuscripts. Comparing internal tobacco industry documents with a disclosure in a peer reviewed publication reveals that even an extensive financial disclosure statement that meets the journal’s requirements can still provide an incomplete understanding of the tobacco industry’s relationship with a project. The documents show how the tobacco industry funds research for multiple reasons, including gaining credibility or developing relationships with scientists that might be useful to the industry in the future. In addition to requiring financial disclosure, journals should require a statement in the Methods section of papers that clearly delineates the sponsor’s role in designing, conducting, and reporting the results of a study. The Enstrom and Kabat BMJ disclosure statement, when compared to the full extent of funding for the study as revealed in the internal industry documents, suggests that competing interest disclosures can be an inadequate mechanism for obtaining a complete understanding of the role of the sponsor in research. BMJ’s competing interest disclosure policy specifically asks authors to disclose only competing financial interests related to their article; the disclosure of any other competing interests is left to the judgment of the author. Although the BMJ, like many other journals, asks for disclosure of relevant financial ties within the last five years, a requirement with which BMJ found that Enstrom and Kabat had complied, it might be more informative for readers to know that an author has a long, steady history of funding from a particular sponsor. Thus, journals could ask for disclosures of financial ties over a longer period of time. Our findings raise the question of what additional steps journals can take to obtain the most meaningful disclosures from authors. An elaborate policing operation is not feasible or necessarily desirable, but a simple search could provide additional information. At least if the paper in question relates to tobacco, BMJ and other journals could conduct a quick search of the tobacco industry documents for the names of authors of papers on tobacco. The documents are freely available on the internet at legacy.library.ucsf.edu and bat.library.ucsf.edu. The industry documents could identify more details of the relationship between researchers and the tobacco industry than required in a simple funding disclosure. Beyond the possibility of identifying undisclosed funding, such searches could provide a description of the tobacco industry’s role in the design, conduct or dissemination of the research. As an alternative to conducting tobacco industry document searchers themselves, journals could seek a peer reviewer with tobacco industry document research experience. Journals should discuss how the tobacco industry documents can be used most effectively to improve and inform the peer review process. In addition to reporting financial ties, it is also important to know what, if any, involvement the sponsor had in the design, conduct, and presentation of the research. One rapid response to the Enstrom and Kabat article suggested that it might be useful for editors to “require a statement about the role of the funding source in the design, conduct, analysis and reporting of the data”.9 We believe that journals should require such a description as part of the Methods section in the paper, as required by Lancet (http://www.thelancet.com/authorinfo). The case of the Enstrom and Kabat paper also raises the issue of whether academic researchers should accept funding from the tobacco industry. A number of universities have adopted policies refusing tobacco industry funding for research.123 These institutions have decided to stop the tobacco industry’s long standing efforts to manipulate research while hiding behind the respect and credibility of the academic institutions. Dr Bero receives about $80 US per year in royalty fees for the publication of The Cigarette Papers, which contains sections on tobacco industry funding of research. Dr Bero has accepted honoraria from: (1) the University of Colorado for conducting workshops in evidence-based medicine; (2) the Friends Research Institute for a talk on financial conflicts of interest and clinical trials; (3) The Association of Medical Writer and Dartmouth University for talks on reporting of scientific research in the lay press; (4) the World Health Organization and Pomona University - European Union Center for talks on public commentary on the Framework Convention on Tobacco Control; (5) Kaiser Permanente for talks on evaluating the quality of research, and tobacco industry manipulation of research; and (6) the World Conference on Clinical Pharmacology and Therapeutics for a talk on managing financial conflicts of interest in clinical trials. None of these presentations were related to the topic of this paper. Ms Hong has never received royalties, honoraria or fees for any presentations or consulting related to the topic of this paper. 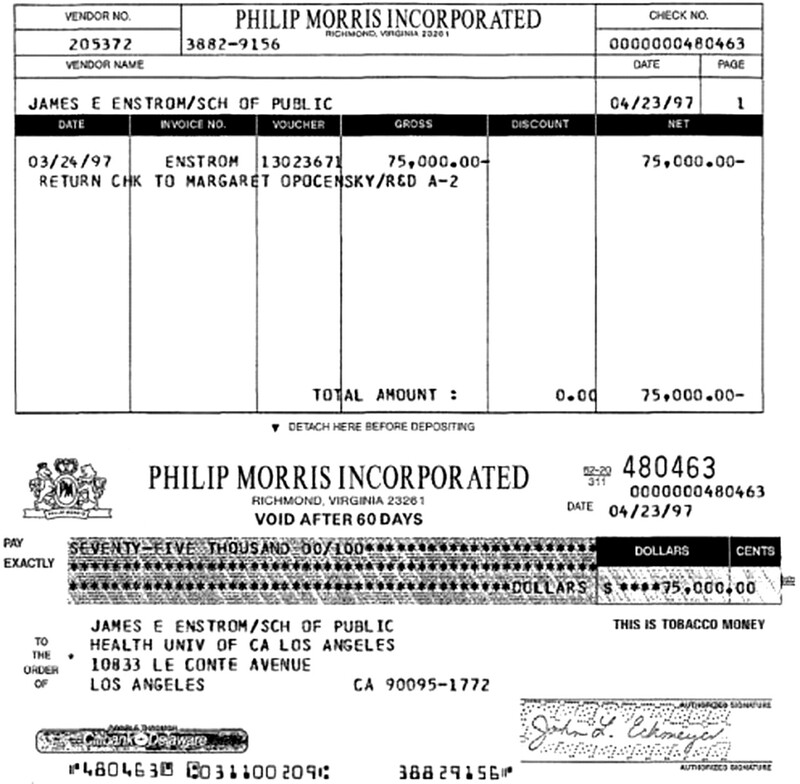 Dr Glantz also receives royalties from publication of The Cigarette Papers. Dr Glantz has received honoraria from various health departments, non-governmental organisations, and academic institutions for making presentations on a variety of topics related to secondhand smoke and tobacco control. Contributorship statement—L Bero conceived and designed the study, advised on the search, read and analysed documents, and drafted the paper. M Hong conducted the document search, read and analysed the documents, and revised the manuscript. S Glantz conceived and designed the study, advised on the search, read and analysed documents, and edited the paper. All three authors take responsibility for the content of the paper. Research support—California Tobacco-Related Disease Research Program grant 9RT0193 and National Cancer Institute grant CA-87472. Enstrom JE, Kabat GC. Environmental tobacco smoke and tobacco related mortality in a prospective study of Californians, 1960–98. BMJ2003;326:1057. National Cancer Institute. Health effects of exposure to environmental tobacco smoke: the report of the California Environmental Protection Agency. Smoking and Tobacco Control Monograph no. 10. Bethesda, Maryland: US Department of Health and Human Services, National Institutes of Health, National Cancer Institute, NIH, 1999. Chase M, O’Connell V. Passive smoke doesn’t kill – or does it? Wall Street Journal16 May 2003. Russell S. Study disputes fears about secondhand smoke, but critics say data is dated. San Francisco Chronicle16 May 2003. Luik J. The second-hand smoke myth: junk science’s greatest triumph. National Post/Financial Post13 June 2003. Thun M. More misleading science from the tobacco industry: delaying clean air laws through disinformation. BMJ USA2003;3:352–3. Enstrom JE, Kabat G, Thun M. Letter and response. BMJ USA2003;3:E266–7. Chaudhry S, Schroter S, Smith R, et al. Does declaration of competing interests affect readers’ perceptions? A randomised trial. BMJ2002;325:1391–2. Horton R. Agreeing the limits of conflict of interest. Rapid response. In: BMJ, 17 May 2003; http://bmj.com/cgi/eletters/326/7398/1057#32327. Hong MK, Bero LA. How the tobacco industry responded to an influential study of the health effects of secondhand smoke. BMJ2002;325:1413–6. Van Kolfschooten F. Can you believe what you read? Nature2002;416:360–3. Campbell P. Declaration of financial interests. Nature2001;412:751. Krimsky S. Science in the private interest. Lanham, Maryland: Rowman & Littlefield Publishers, Inc, 2003. Goozner M. Unrevealed: non-disclosure of conflicts of interest in four leading medical and scientific journals. Washington DC: Center for Science in the Public Interest, 12 July 2004. Shamoo AE, Resnik DB. Responsible conduct of research. New York: Oxford University Press, 2003. Schafer A. Biomedical conflicts of interest: a defence of the sequestration thesis. Journal of Medical Ethics. 2003;online electronic version :1–40. Dana J. Harm avoidance and financial conflict of interest. Journal of Medical Ethics. 2003;online electronic version :1–18. Krimsky S, Rothenberg LS. Conflict of interest policies in science and medical journals: editorial practices and author disclosures. Sci Eng Ethics2001;7:205–18. Krimsky S, Rothenberg LS, Stott P, Kyle G. Financial interests of authors in scientific journals: a pilot study of 14 publications. Sci Eng Ethics1996;2:395–410. Thun MJ. Passive smoking: tobacco industry publishes disinformation. BMJ2003;327:502–3 author reply 505; discussion 505. Gardiner P. The case of the footnote wagging the article: a footnote with legs. BMJ19 August 2003. Enstrom J, Univ Ca Los Angeles School Of Public Health. May 5, 1975. Council for Tobacco Research. Access date July 25, 2003. Bates No. 50207899/7899. http://legacy.library.ucsf.edu/tid/qdi79c00. Enstrom J, Univ Ca Los Angeles School Of Public Health. June 3, 1975. Council for Tobacco Research. Access date July 25, 2003. Bates No. 50207891/7892. http://legacy.library.ucsf.edu/tid/ldi79c00. CTR, Jacobson L. SAB Executive Comm. Informal Inquiry (Case No. 335). July 17, 1975. Council for Tobacco Research. Access date July 25, 2003. Bates No. 50207888/7888. http://legacy.library.ucsf.edu/tid/idi79c00. Enstrom J, Univ of Ca. January 5, 1976. Council for Tobacco Research. Access date July 25, 2003. Bates No. HK2232075/2075. http://legacy.library.ucsf.edu/tid/quk2aa00. Enstrom J, Univ Ca. April 22, 1976. Council for Tobacco Research. Access date July 25, 2003. Bates No. HK2232055/2055. http://legacy.library.ucsf.edu/tid/guk2aa00. Enstrom J, Univ Ca Los Angeles School Of Public Health. February 13, 1978. Council for Tobacco Research. Access date July 25, 2003. Bates No. 50265168/5168. http://legacy.library.ucsf.edu/tid/hgi89c00. Lincoln J. Rising Lung Cancer Mortality among Non-Smokers. June 1, 1979. Philip Morris. Access date July 25, 2003. Bates No. 1003040070. http://legacy.library.ucsf.edu/tid/eye94e00. Lee P. April 8, 1982. Philip Morris. Access date July 25, 2003. Bates No. 2501325895/5896. http://legacy.library.ucsf.edu/tid/ohq29e00. Gibbon J. September 5, 1979. Philip Morris. Access date July 25, 2003. Bates No. 2062775652/5653. http://legacy.library.ucsf.edu/tid/sig87e00. Enstrom JE. Rising lung cancer mortality among nonsmokers. J Natl Cancer Inst1979;62:755–60. Enstrom J. May 23, 1990. Philip Morris. Access date July 25, 2003. Bates No. 2021162691. http://legacy.library.ucsf.edu/tid/xoj52d00. Pages R. Letter from James Enstrom, UCLA. November 7, 1990. Philip Morris. Access date July 25, 2003. Bates No. 2021561446. http://legacy.library.ucsf.edu/tid/sqe58e00. Bero LA, Glantz S. Tobacco industry response to a risk assessment of environmental tobacco smoke. Tobacco Control1993;2:103–13. Janerich DT, Thompson WD, Varela LR, Greenwald P, Chorost S, Tucci C, et al. Lung cancer and exposure to tobacco smoke in the household. N Engl J Med1990;323:632–6. Borelli T. October 11, 1990. Philip Morris. Access date July 25, 2003. Bates No. 2023582346/2348. http://legacy.library.ucsf.edu/tid/tgc34e00. Barnes DE, Bero LA. Industry-funded research and conflict of interest: an analysis of research sponsored by the tobacco industry through the Center for Indoor Air Research. J Health Polit Policy Law1996;21:515–42. Enstrom J. October 22, 1990. Philip Morris. Access date July 25, 2003. Bates No. 2021162640/2642. http://legacy.library.ucsf.edu/tid/hhj46e00. Johnston M. 001100 Monthly Report, Demographics and Statistics. November 26, 1990. Philip Morris. Access date July 25, 2003. Bates No. 2022209389/9391. http://legacy.library.ucsf.edu/tid/tol44e00. Enstrom J. Health and Human Services Department of Health, Human Services, Office On Smoking + Health, Public Health Service. The Health Consequences of Smoking Cardiovascular Disease. Section 8 the Effect of Cigarette Smoking Cessation on Coronary Heart Disease. 1983. Philip Morris. Access date September 18, 2003. Bates No. 2021561450/1468. http://legacy.library.ucsf.edu/tid/uqe58e00. CTR, Mc Allister Pierce. Preliminary Application Number: 3542 James E. Enstrom, Ph.D. University of California Los Angeles, Ca. October 4, 1991. Council for Tobacco Research. Access date July 25, 2003. Bates No. 40001970/1972. http://legacy.library.ucsf.edu/tid/hix89c00. Enstrom J, Univ Ca Los Angeles School Public Health, Hansen M, Univ Ca Los Angeles Ctr. Application for Research Grant Mortality Trends among Smokers and Nonsmokers. November 27, 1991. Council for Tobacco Research. Access date July 25, 2003. Bates No. 40001947/1960. http://legacy.library.ucsf.edu/tid/aix89c00. Stone D. Grant Application No. 3333 James E. Enstrom, Ph.D., University of California, Los Angeles, Ca New Application No. 3333 ‘Mortality Trends among Smokers and Nonsmokers’. December 17, 1991. Lorillard. Access date July 25, 2003. Bates No. 87603337. http://legacy.library.ucsf.edu/tid/ppl11e00. Eisenberg A. Renewal of Application for the Spring 1994 SAB Meeting Mortality among Smokers and Nonsmokers. 1993 Council for Tobacco Research. Access date July 25, 2003. Bates No. 40001910/1910 http://legacy.library.ucsf.edu/tid/ojx89c00. Enstrom J, Univ Ca Los Angeles School Public Health, Martin S, Univ Ca Los Angeles School Public Health Ctr. Non-Competing Renewal Grant Application Mortality Trends among Smokers and Nonsmokers. November 28, 1996. Council for Tobacco Research. Access date July 25, 2003. Bates No. 40001775/1780. http://legacy.library.ucsf.edu/tid/jkx89c00. Enstrom J, Univ Ca Los Angeles School Public Health Ctr. Notice of Research Grant Mortality Trends among Smokers and Nonsmokers. July 1, 1997. Council for Tobacco Research. Access date July 25, 2003. Bates No. 40001787/1787. http://legacy.library.ucsf.edu/tid/lkx89c00. Enstrom J, Univ Ca School Public Health, Glenn Jf Ctr, Mcallister Hc Ctr. 3333ar2. October 23, 1997. Council for Tobacco Research. Access date July 25, 2003. Bates No. 40001769/1769. http://legacy.library.ucsf.edu/tid/elx89c00. Enstrom JE, Heath CW Jr. Smoking cessation and mortality trends among 118,000 Californians, 1960–1997. Epidemiology1999;10:500–12. Enstrom JE. Smoking cessation and mortality trends among two United States populations. J Clin Epidemiol1999;52:813–25. Enstrom J, Univ Of Ca. Environmental Tobacco Smoke and Lung Cancer in Nonsmoking Women: A Reanalysis. April 24, 1996. RJ Reynolds. Access date July 25, 2003. Bates No. 515638686/8686. http://legacy.library.ucsf.edu/tid/bpi30d00. Fontham ET, Correa P, Reynolds P, Wu-Williams A, Buffler PA, Greenberg RS, et al. Environmental tobacco smoke and lung cancer in nonsmoking women. A multicenter study. JAMA1994;271:1752–9. Review of Article By: Fontham, et al. ‘Environmental Tobacco Smoke and Lung Cancer in Nonsmoking Women - a Multicenter Study’, J. Amer. Med. Assoc. 271: 1752–1759 (940000). 1994. Philip Morris. Access date August 6, 2003. Bates No. 2046349691/9693. http://legacy.library.ucsf.edu/tid/ozq92e00. Enstrom J. Environmental Tobacco Smoke and Lung Cancer in Nonsmoking Women: A Reanalysis. June, 1996. Philip Morris. Access date July 25, 2003. Bates No. 2063610704/0732. http://legacy.library.ucsf.edu/tid/hhl67e00. Enstrom J. Environmental Tobacco Smoke and Lung Cancer in Nonsmoking Women: A Reanalysis. August, 1996. Philip Morris. Access date August 6, 2003. Bates No. 2065122063. http://legacy.library.ucsf.edu/tid/hsl87d00. Furr J, Womble Carlyle. EPA Litigation -- Enstrom Publication. May 9, 1996. RJ Reynolds. Access date July 25, 2003. Bates No. 515638685/8685. http://legacy.library.ucsf.edu/tid/api30d00. Dreyer L. Fax Cover. May 20, 1996. Philip Morris. Access date July 25, 2003. Bates No. 2061693533. http://legacy.library.ucsf.edu/tid/lvn67d00. Dreyer L. JAMA - James E. Enstrom. May 20, 1996. Philip Morris. Access date August 06, 2003. Bates No. 2061693534. http://legacy.library.ucsf.edu/tid/mvn67d00. Walk R. Enstrom’s Paper. June 4, 1996. Philip Morris. Access date July 25, 2003. Bates No. 2063610701. http://legacy.library.ucsf.edu/tid/rhq22d00. Dreyer L. June 6, 1996. Philip Morris. Access date July 25, 2003. Bates No. 2065122116. http://legacy.library.ucsf.edu/tid/gik17d00. Manuscript Criteria and Information. January 3, 1996. Philip Morris. Access date August 06, 2003. Bates No. 2065122117. http://legacy.library.ucsf.edu/tid/hik17d00. Vonholt K. Telefax Message No. : 9832 Publication of James E. Enstrom. June 5, 1996. Philip Morris. Access date July 25, 2003. Bates No. 2065122106. http://legacy.library.ucsf.edu/tid/wrl87d00. Philip Morris. Comments on the Paper “Environmental Tobacco Smoke and Lung Cancer in Nonsmoking Women: A Reanalysis” by James E. Enstrom. June 5, 1996. Philip Morris. Access date August 6, 2003. Bates No. 2065122107/2109. http://legacy.library.ucsf.edu/tid/zhk17d00. Enstrom J. Proposed Research on Passive Smoking. July 15, 1996. Philip Morris. Access date July 25, 2003. Bates No. 2063610840/0841. http://legacy.library.ucsf.edu/tid/wil67e00. Rennie D, Jeff X. Ms Number Sc6159, “Environmental Tobacco Smoke and Lung Cancer In.” August 23, 1996. Philip Morris. Access date July 25, 2003. Bates No. 2065122062. http://legacy.library.ucsf.edu/tid/gsl87d00. Enstrom J. Summary Response to Reviewer’s Comments Ms No Sc6159: “Environmental Tobacco Smoke and Lung Cancer in Nonsmoking Women a Reanalysis”. August, 1996. Philip Morris. Access date July 25, 2003. Bates No. 2065122065/2066. http://legacy.library.ucsf.edu/tid/jsl87d00. Enstrom J. Proposed Research on the Relationship of Low Levels of Active Smoking to Mortality. January 15, 1997. Philip Morris. Access date July 25, 2003. Bates No. 2074067439/7451. http://legacy.library.ucsf.edu/tid/imf37d00. Scientific Research Review Committee (SRRC) Charter. April 12, 1995. Philip Morris. Access date July 30, 2003. Bates No. 2057992020/2035. http://legacy.library.ucsf.edu/tid/wen13e00. Enstrom J. Proposed Research on the Relationship of Low Levels of Active Smoking to Mortality. January 15, 1997. Philip Morris. Access date July 25, 2003. Bates No. 2075873003. http://legacy.library.ucsf.edu/tid/dfk37d00. Carchman RNG. Research Inquiry for Interim Review. January 21, 1997. Philip Morris. Access date July 25, 2003. Bates No. 2075873032. http://legacy.library.ucsf.edu/tid/pek37d00. Nixon GXC. Research Inquiry for Interim Review. January 21, 1997. Philip Morris. Access date July 25, 2003. Bates No. 2075873022. http://legacy.library.ucsf.edu/tid/gek37d00. Nixon G. Research Inquiry for Interim Review. January 21, 1997. Philip Morris. Access date July 25, 2003. Bates No. 2063654072. http://legacy.library.ucsf.edu/tid/myf67e00. Enstrom J. Short Comments to Proposed Research on the Relationship of Low Levels of Active Smoking to Mortality. February 6, 1997. Philip Morris. Access date July 25, 2003. Bates No. 2505415042/5043. http://legacy.library.ucsf.edu/tid/cmr29c00. Carchman R. April 25, 1997. Philip Morris. Access date July 25, 2003. Bates No. 2063610867. http://legacy.library.ucsf.edu/tid/gjl67e00. Eckmeyer J. Check No. 0000000480463. April 23, 1997. Philip Morris. Access date July 25, 2003. Bates No. 2063610868. http://legacy.library.ucsf.edu/tid/hjl67e00. Carchman R. Principal Investigator: James E. Enstrom, Ph.D., M.P.H. Grant Title: ‘Relationship of Low Levels of Active Smoking to Mortality’. January 30, 1998. Philip Morris. Access date July 25, 2003. Bates No. 2063654067. http://legacy.library.ucsf.edu/tid/hyf67e00. Check No 0000000565045. January 29, 1998. Philip Morris. Access date July 25, 2003. Bates No. 2063654068. http://legacy.library.ucsf.edu/tid/iyf67e00. Scientific Research Review Committee Funding. April 9, 1999. Philip Morris. Access date July 25, 2003. Bates No. 2076950667/0670. http://legacy.library.ucsf.edu/tid/fle85c00. Scientific Research Review Committee Funding. 2000. Philip Morris. Access date July 25, 2003. Bates No. 2078564555/4559. http://legacy.library.ucsf.edu/tid/neo70c00. Enstrom J. Proposed Research on Passive Smoking. May 22, 1996. Philip Morris. Access date July 25, 2003. Bates No. 2065122057. http://legacy.library.ucsf.edu/tid/csl87d00. Enstrom J. Proposed Research on Passive Smoking. June 28, 1996. Philip Morris. Access date July 25, 2003. Bates No. 2505100125/0130. http://legacy.library.ucsf.edu/tid/lgp29c00. Eisenberg M. Board of Directors’ Meeting - 960813 & 960814. August 1, 1996. Lorillard. Access date July 25, 2003. Bates No. 86618593. http://legacy.library.ucsf.edu/tid/qnj23c00. Eisenberg M. Minutes of Meeting of the Board of Directors Baltimore Marriott Inner Harbor Hotel 960814. August 14, 1996. Philip Morris. Access date July 25, 2003. Bates No. 2063650528/0529. http://legacy.library.ucsf.edu/tid/upg67e00. Enstrom J, Oey J, Reininghaus W, et al. Documentation P 0268/2195 Comments On: “Proposed Research on Passive Smoking”. June 28, 1996. Philip Morris. Access date July 25, 2003. Bates No. 2505100107/0112. http://legacy.library.ucsf.edu/tid/ggp29c00. Enstrom J. Comments to Proposed Research on Passive Smoking. October 30, 1996. Philip Morris. Access date July 25, 2003. Bates No. 2502317159/7160. http://legacy.library.ucsf.edu/tid/xuv22d00. Eisenberg A. Minutes of Meeting of the Board of Directors CIAR Offices 961125 & 961126. November 26, 1996. Philip Morris. Access date July 25, 2003. Bates No. 2063650515/0518. http://legacy.library.ucsf.edu/tid/nbh67e00. Center for Indoor Air Research Board of Director’s Meeting, Agenda. May 15, 1997. Philip Morris. Access date July 25, 2003. Bates No. 2063650514. http://legacy.library.ucsf.edu/tid/mbh67e00. Minutes of Meeting of the Board of Directors. May 15, 1997. RJ Reynolds. Access date July 25, 2003. Bates No. 517578187/8188. http://legacy.library.ucsf.edu/tid/ecj82d00. Fields N, Chapman S. Chasing Ernst L Wynder: 40 years of Philip Morris’ efforts to influence a leading scientist. J Epidemiol Community Health2003;57:571–8. Kabat GC, Wynder EL. Lung cancer in nonsmokers. Cancer1984;53:1214–21. Kabat GC, Stellman SD, Wynder EL. Relation between exposure to environmental tobacco smoke and lung cancer in lifetime nonsmokers. Am J Epidemiol1995;142:141–8. Kasuga H. Indoor Air Quality. In: Papers from the Conference on Indoor Air Quality; 1987 November 4–6; Tokyo, Japan: Springer-Verlag, 1987. Shimozu Y. December 26, 1986. Dept of Smoking and Health. Accessed 9 March, 2005. Bates No. 2025816160. http://legacy.library.ucsf.edu/tid/xkn14e00. Osdene T. March 23, 1987. Philip Morris. Accessed 10 March 2005. Bates No. 2023544258. http://legacy.library.ucsf.edu/tid/kon34e00. Egawa M. April 30, 1987. Philip Morris. Accessed 10 March, 2005. Bates No. 2021653475. http://legacy.library.ucsf.edu/tid/vaq53e00. Bero LA, Galbraith A, Rennie D. Sponsored symposia on environmental tobacco smoke. JAMA1994;271:612–7. Koo LC, Kabat GC, Rylander R, et al. Dietary and lifestyle correlates of passive smoking in Hong Kong, Japan, Sweden, and the U.S.A. Soc Sci Med1997;45:159–69. Muggli ME, Hurt RD, Blanke D. Science for hire: A tobacco industry strategy to influence public opinion on secondhand smoke. Nicotine Tob Res2003;5:303–14. Carchman R. August 26, 1997. Philip Morris. Access date July 25, 2003. Bates No. 2063610866. http://legacy.library.ucsf.edu/tid/fjl67e00. Enstrom J. August 28, 1997. Philip Morris. Access date July 25, 2003. Bates No. 2063610775. http://legacy.library.ucsf.edu/tid/fil67e00. Enstrom J. Directions to Office at UCLA: 10911 Weyburn Avenue, Suite 234. September 5, 1996. Philip Morris. Access date July 25, 2003. Bates No. 2063610777. http://legacy.library.ucsf.edu/tid/hil67e00. Directions to UCLA Office of James E. Enstrom, Phd. September, 1996. Philip Morris. Access date July 25, 2003. Bates No. 2063610778. http://legacy.library.ucsf.edu/tid/iil67e00. Enstrom J. Directions to UCLA Office. September 15, 1997. Philip Morris. Access date July 25, 2003. Bates No. 2063610779. http://legacy.library.ucsf.edu/tid/jil67e00. Carchman R. September 15, 1997. Philip Morris. Access date July 25, 2003. Bates No. 2063610773. http://legacy.library.ucsf.edu/tid/dil67e00. Enstrom J. September 11, 1997. Philip Morris. Access date July 25, 2003. Bates No. 2063610765. http://legacy.library.ucsf.edu/tid/whl67e00. Itinerary Dr. Richard A. Carchman. September 19, 1997. Philip Morris. Access date July 25, 2003. Bates No. 2063610766. http://legacy.library.ucsf.edu/tid/xhl67e00. Eisenberg M. CIAR Proposals. November 3, 1997. Philip Morris. Access date July 25, 2003. Bates No. 2076979214. http://legacy.library.ucsf.edu/tid/cjn76c00. Enstrom JE. Proposed Research on Passive Smoking. October 20, 1997. Brown and Williamson. Access date July 25, 2003. Bates No. 566943549/3579. http://legacy.library.ucsf.edu/tid/oxw91d00. Coggins C. 980000 CIAR Funding. November 13, 1997. Philip Morris. Access date July 25, 2003. Bates No. 2081922926. http://legacy.library.ucsf.edu/tid/jlc45c00. Enstrom J. Comments on Proposal: Environmental Tobacco Smoke and Mortality among CPS I. November, 1991. Lorillard. Access date July 25, 2003. Bates No. 86618301. http://legacy.library.ucsf.edu/tid/ymg44c00. Eisenberg M. Center for Indoor Air Research; Minutes of Meeting of the Board of Directors. November 19, 1997. Brown and Williamson. Access date July 25, 2003. Bates No. 566943448/3450. http://legacy.library.ucsf.edu/tid/mpx11c00. CIAR-Funded Projects. 890000-990000. August 31, 1999. Philip Morris. Access date July 25, 2003. Bates No. 2505442777/2960. http://legacy.library.ucsf.edu/tid/xmo05c00. Solana RP. Philip Morris, Philip Morris Incorporated. Request for Applications 20000000 Research Focus. 2000. Philip Morris. Access date August 28, 2003. Bates No. 2505385917/5946. http://legacy.library.ucsf.edu/tid/jyd39c00. Rickert B. LABSTAT. Fax Cover Expert Committee. May 7, 1998. Philip Morris. Access date August 28, 2003. Bates No. 2060552188. http://legacy.library.ucsf.edu/tid/qeg13e00. [Letter addressed to Bill Rickert (LABSTAT) re: epidemiology experts---PN Lee, James Enstrom, Alvin Feinsten]. May 7, 1998. Philip Morris. Access date August 28, 2003. Bates No. 2063613116/3117. http://legacy.library.ucsf.edu/tid/fsk67e00. Epidemiologic Working Session:. Measuring the Impact of Changing Cigarette Design and Use on Health Endpoints for Smokers and Nonsmokers Meeting Agenda 20000605 20000606 Hyatt Regency Richmond, Va. June 5, 2000. Philip Morris. Access date August 28, 2003. Bates No. 2505266747. http://legacy.library.ucsf.edu/tid/ynq39c00. Nelson B. PMUSA PMU. [Letter from Bettie Nelson to James Enstrom re: attending epidemiology working session “Measuring the Impact of Changing Cigarette Design and Use on Health Endpoints for Smokers and Nonsmokers”], May 18, 2000. Philip Morris. Access date August 28, 2003. Bates No. 2073736520. http://legacy.library.ucsf.edu/tid/vrx85c00. Scollo M, Lal A, Hyland A, et al. Review of the quality of studies on the economic effects of smoke-free policies on the hospitality industry. Tobacco Control2003;12:13–20. Bero L. Tobacco industry manipulation of research. Public Health Reports. (in press). Muggli ME, Forster JL, Hurt RD, et al. The smoke you don’t see: uncovering tobacco industry scientific strategies aimed against environmental tobacco smoke policies. Am J Public Health2001;91:1419–23. Hirschhorn N, Bialous SA, Shatenstein S. Philip Morris’ new scientific initiative: an analysis. Tobacco Control2001;10:247–52. Boyd EA, Lipton S, Bero L. Implementation of financial disclosure policies to manage conflicts of interest. Health Affairs2004;23:206–14. Malone RE, Bero LA. Chasing the dollar: why scientists should decline tobacco industry funding. J Epidemiol Community Health2003;57:546–8. Editor’s noteThis article replaces a previous version that was posted on the Tobacco Control website on 9 December 2004 and taken down on 11 February 2005.